We often hear comments like, why does your meat taste so much better? One of the secrets is our fresh and delicious well water. Whenever we come home after a vacation we are always eager to return to our tap water. We have friends who bring empty gallon jugs to fill and take home with them because they too love the taste of the water. The same is true for our animals who have 24/7 access to water. Here is one of our katadin ewe sheep, Mrs. White with one of her lambs, enjoying a drink from our automatic Nelson waterer. We have many of these waterers situated around the farm so animals can access water easily. In the winter they stay unfrozen because underneath the canister is an eight foot pit which allows geothermal heat to rise. There is an electric heating element just under the bowl for very cold weather. 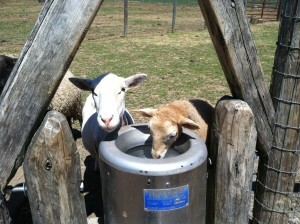 This is a huge labor saver and the animals really appreciate fresh flowing water whenever they wish.